Sunnin' In the City: It Took Me One Week! It Took Me One Week! It took me only ONE week ( I waited a while to post in hopes of it making a miraclous recovery), but I have done it again. I have killed yet another plant. 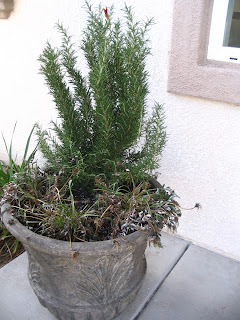 Although the rosemary looks like it may make it, the daisy type flowers have seen better days. ANY SUGGESTIONS would be helpful! Caiden keeps asking me why I am killing the plant. I want to have a good answer for him. The stuff in the middle still looks good. Just rip out the little flowers and pretend they were never there.